George Henshaw, age 29, born in Tennessee; farmer; $4000 real estate. Polly M. Henshaw, age 21, born in Illinois. Stephen Henshaw, age 1, born in Illinois. Elcan Hunter, age 19, born in Tennessee; laborer. George Hinshaw, age 37, born in Tennessee; $25,000 real estate; $2,000 personal property. Polly Hinshaw, age 21, born in Illinois. 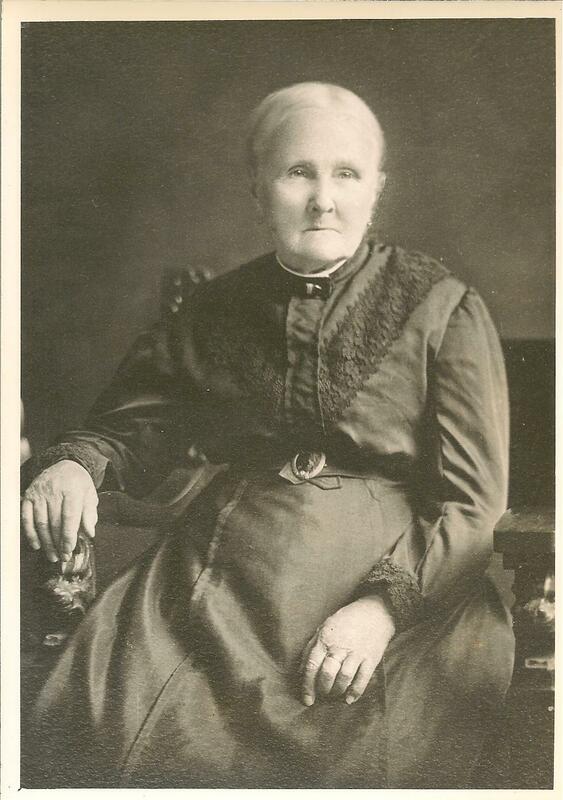 Ida Hinshaw, age 3, born in Illinois. Harriet Hinshaw, age 2 months, born in Illinois. Ellen Bailey, age 13, born in Ohio; [..occupation unclear..]. John Bailey, age 22, born in Ohio; laborer. Hinshaw, George, age 47, born in Tennessee; farmer; $100,000 real estate; $10,000 personal property. Hinshaw, Polly M., age 41, born in Illinois; keeping house. Hinshaw, Ida, age 13, born in Illinois; attended school. Hinshaw, Ezra, age 7, born in Illinois. Hinshaw, Toby, age 5, born in Illinois. Hinshaw, Rolla, age 3, born in Illinois. Hinshaw, Susanna, age 77, born in Virginia; keeping house. Haman, Charles, age 20, born in Prussia; laborer; parents foreign-born. Hinshaw, Molly, age 51, born in Illinois; parents born in North Carolina; widow; keeping house. 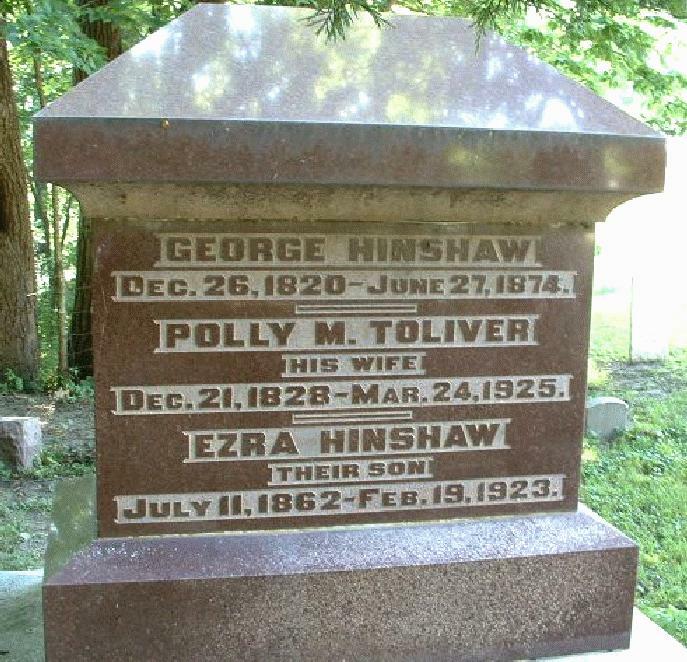 Hinshaw, Ezra, son, age 18, born in Illinois; father born in Tennessee; mother born in Illinois. Hinshaw, Toby, son, age 16, born in Illinois; father born in Tennessee; mother born in Illinois. Hinshaw, Roland, son, age 12, born in Illinois; father born in Tennessee; mother born in Illinois; attended school. Sheet, Frank, servant, age 22, born in Illinois; parents born in Germany; farm laborer. Waterman, Emma, servant, age 19, born in Kentucky; parents born in Virginia; domestic. "As to personal appearance he is tall and portly. When he was twenty-seven years of age he had a severe sickness, was ill for a long time with the typhoid fever, and since then he has been very stout in appearance. He has a large head and a large brain; has small sparkling eyes, and a pleasant, genial countenance; he is full of fun and appreciates a joke. He has a firm, resolute character, combined with a mild and pleasant disposition. He is always ready to meet his friends with real English cheer, and indeed he appears a 'fine old English gentleman, one of the olden time'." 1850 census, Bloomington, McLean County, Illinois; roll M432-117, page 5B, line #31, dwelling #325, family #334. 1860 census, 3rd Ward, Bloomington, McLean County, Illinois; page 719, line #33, dwelling #1601, family #1612. 1870 census, Bloomington P.O., Bloomington Township, McLean County, Illinois; roll M593-258, page 43, line #16, dwelling #90, family #90. McLean County Historical Society; McLean County book B pg 157. 1860 census, 3rd Ward, Bloomington, McLean County, Illinois; page 719, line #39, dwelling #1601, family #1613. 1870 census, Bloomington P.O., Bloomington Township, McLean County, Illinois; roll M593-258, page 43, line #8, dwelling #89, family #89. 1920 census, Bloomington Township, McLean County, Illinois; roll T625-386, ED 89, page 8B, line #65, dwelling #188, family #197.